Product #16100 | SKU ATH-M50XWH | 5.0 (based on 1 rating) Thanks for your rating! 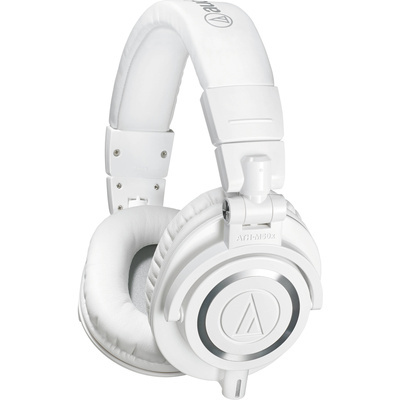 The white ATH-M50x Monitor Headphones from Audio Technica are designed for use in critical studio mixing and tracking as well as for DJ monitoring applications. They feature 45mm Neodymium drivers with copper-clad aluminium voice coils that provide an extended frequency response from 15Hz to 28kHz. The headphones have a circumaural, around-the-ear design that provides sound isolation in loud environments. The ATH-M50x's ear cups can be swivelled 90-degrees, allowing for single-ear monitoring. The headphones have a detachable single-sided cable system, and a 3-metre coiled cable, a 3-metre straight cable, and a 1.2-metre straight cable are included. When not in use, the ATH-M50x can be folded down and stored in the included carry pouch. One of the best headphones I've ever used throughout my entire life.. Suits those who are audiophiles or wanting a better sound in competitive gaming (Especially CS: Global Offensive)..